Welcome to Barclay Lake Village, the hidden gem of Shelby Twp., our premier new home community of 17 beautiful home sites surrounding a pristine 6 acre lake. Offered by Ladd's and built by Garrett Homes, the 2300 sq ft Chelsea colonial features an 18' great room with enormous windows and custom-mantled fireplace. 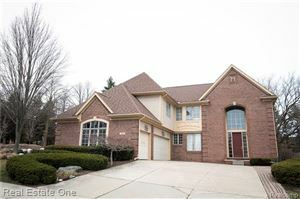 Open floor plan has great room opening to gourmet kitchen with Lafata cabinets, granite, center island, and hdwd floors. Four bedrooms, including a luxurious master suite with tray ceiling, attached bath with dual sinks, amazing shower & soaker tub, granite & tile, enormous closet. Min 9'ceilings, tile laundry and bath floors/shower walls, granite, Lafata cabinets, hardwood floors & more. This homesite also has a daylight basement. June move-in! The data relating to real estate properties on this website was last updated as recently as 4/23/19 3:26 PM PDT.